Current level of performance Introduction The level of performance that I am at can currently be put into six groups. 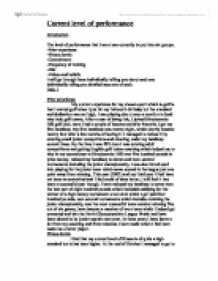 -Prior experience -Fitness levels -Commitment -Frequency of training -Diet -Values and beliefs I will go through these individually telling you about each one individually telling you detailed accounts of each. Task 1 Prior experience My current experience for my chosen sport which is golf is that I started golf when I just hit my thirteenth birthday but the standard and dedication was not high, I was playing about once a month at a local nine hole golf coarse. After a year of doing this, I joined Stinchcombe Hill golf club, were I had a couple of lessons and after 4months I got my first handicap. My first handicap was twenty eight, which shortly became twenty four after a few months of having it. I managed to reduce it by entering small junior competitions and shooting under my handicap several times. By the time I was fifth teen I was entering adult competitions and getting English golf union coaching which helped me to take in my second year at Stinchcombe Hill over five hundred pounds in prize money, reduced my handicap to eleven and won several tournaments including the junior championship, I was also introduced into playing for the junior team which came second in the league just one point away from winning. ...read more. golf balls with along iron - Hit ten balls with a wood -On short game area - Practice chipping from five yards then when you hole one go to ten yards then hole one of them and go from fifth teen yards. -Go to practice bunker with five balls and don't stop until you hit all five continuously from twenty yards to within two club lengths. -Putting green -Putt five balls in two shots or less for each ball continuously from fifty too seventy feet. -Hole five putts and you can't leave the putting green until you have holed every ball continuously from three feet then six feet then nine feet. -Warm up -Twenty star jumps -Two minute jog on the spot -Stretch major muscles used in round. Diet What diet! I eat what I want when I want I eat a regular amount of all the seven food groups. I eat near enough every type of food and I have a very high metabolism and do a lot of physical exercise to stop me getting over weight. I feel that I eat far too much including four meals a day with snacks in between but I have a very good physique and am if any way underweight for my height as I am six foot and eleven and a half stone. An average day of food consumption in my life would be two slices of toast in the mourning Followed with a sausage roll a couple ...read more. Main barriers Here is a list of the main barriers I need to over come to achieve my short, medium and long term goals. - More practice in winter. - At least one round of golf at the weekend. - At least three hours of practice a week. - At least five hours of practice in the summer. 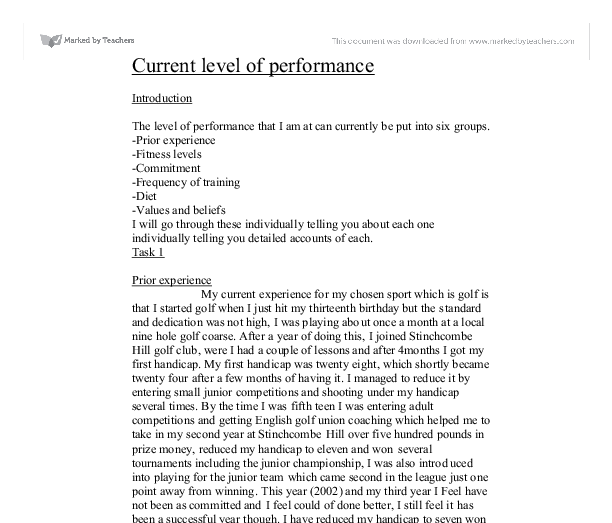 Task 4 Evaluation of my performance There are many factors in the performance of golf from putting to anxiety control so I have devised a programme to show how I have performed in the last month. (V. poor) 1 2 3 4 5 (V. good) Putting - Chipping - Sand play - Short irons - Mid irons - Long irons - Driving - Visualisation - Concentration - Anxiety control - Motivation - Confidence - Effort - Practice time - As you can see my analysis table shows that I am performing poorly in most areas of my game at the moment this is due to lack of practice. I have practiced quite lot in the last month but I have only practiced on driving, mid irons, and short irons which is why in performing good in them areas at the moment. My short game is very poor at the moment which is affecting other areas such as motivation, confidence and most of the mental game. I feel that if I get my short game back to a high standard which will involve a lot of practice then I'll can get my mental game back as good as it once was. ...read more. As Gerard is about to receive a ball, he faces the ball sideways on, with his legs a yard apart. From this position he is able to have the most effective first touch as he is able to move the ball quicker on receiving it. * Causes damage to and reduced the capacity and efficiency of the lungs * Reduces the oxygen carrying capacity of the blood * Negatively affects the process of gaseous exchange Smokers don't do this to themselves. Passive smoking or inhaling smoke from somebody else's cigarette is also just as dangerous. I used the same equipment as I did last week which was the bench press, the dumbbells, the rowing machine, the leg/calf press, the trapezius and an abdominal crunch. Somatic anxiety can be beneficial, however I must consider if the performer is introverted or extroverted; the extrovert will definitely benefit from a higher somatic anxiety (given that, when comparing, all other factors are kept the same). I can conclude this from my results. Another weakness that Uways has is his drop shot. The tick sheet shows that he only had four successful drop shots out of ten. This shot has to be played at the correct time and the correct place, the opponent should be an air distance from the net and he should be fairly close to the net. Exercising involving the lactic acid energy source generally has an exercise-to-rest ratio of 1:2 (one second of activity, to two seconds of rest). Full recovery is not achieved, but as athletes perform more of this type of training, they will be better able to tolerate and utilize increased concentrations of lactic acid. James Anderson for England also has a very good technique as he can control his swing and length of the bowl. be training incase you get injured and can't move so people will no where to come looking for you. Which in addition take a mobile telephone so you can call a member of your family, a friend or an emergency service for any emergency you may have.